Andrew Ernemann brainstormed on how to go beyond market reports to carve a niche in the Aspen real estate market. He launched The Aspen Property Experience in December. Aspen real estate agent Andrew Ernemann would rather make money than war when it comes to using virtual reality. As anyone who watched the Super Bowl commercials Sunday night saw, one of the big ways companies are using virtual reality is in war games. But Ernemann believes the immersive technology also is a new frontier for selling real estate. 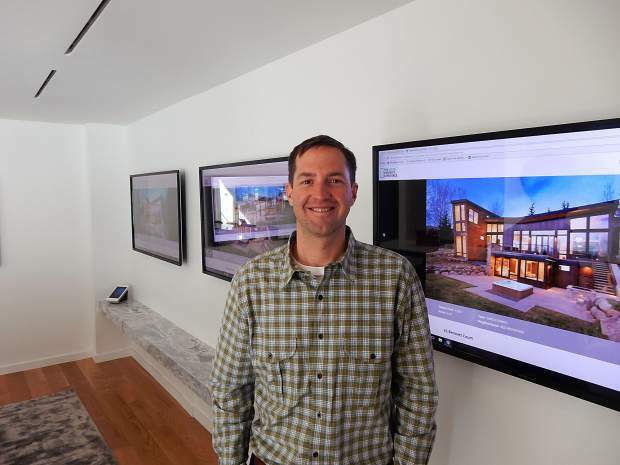 He has created a virtual reality real estate showroom on Main Street in Aspen where he combines web-based touchscreen televisions and virtual reality goggles to give prospective buyers a unique experience and different way to pursue options. Ernemann has been a big number cruncher during his real estate career. He produces thorough reports on sales trends at regular intervals throughout the year. But, he noted, lots of real estate agents are churning out market reports these days. “About a year ago, I said, ‘What’s next? What’s my next niche?’” Ernemann said. His research indicated that while virtual reality tours are being enlisted in the real estate trade in Los Angeles, Manhattan and Australia, it hasn’t been used to a great degree in the Roaring Fork Valley. He rented office space on his own at 426 E. Main St. and set up The Aspen Property Experience. The office is open by appointment only, with Ernemann meeting with clients one on one or it’s equipped for small cocktail parties. He also can share listings in a different way with other real estate agents. One aspect of the experience is employing a bank of various-sized touchscreen TVs to search for and assess listings in an interactive, different way. Clients can sort listings in a number of different ways using a touchscreen. They can sort by neighborhood, price or property type, for example. There’s a 3D tour available for every property along with videos from a drone and pictures. If a prospective buyer wants to see the views from the deck of a house at Wildcat, it’s possible without taking the trip out there. But the Aspen Property Experience takes it up a notch with an immersive and interactive virtual-reality tour employing an assortment of VR goggles from Google, Samsung, Oculus Rift and HTC Vive. Putting on a set of goggles is like Alice popping down a rabbit hole and emerging in Wonderland. On one particular day, he was featuring a 3D tour of the unbuilt Victorian Square Penthouse. By pointing and clicking with a handset, the viewer gains different perspectives from different vantage points within the penthouse. You can head out to the deck to check the views visible of Aspen Mountain and surrounding landscapes. Ernemann is working with three builders and three architects to showcase homes they are working on. His collaborators can work with prospective clients on specific design features that could potentially seal a deal. The virtual-reality tour can be used, for example, to try different interior finishes and show the views from windows before the residence is built. It allows the team to “sell properties that are earlier in the pipeline,” Ernemann said. He isn’t ready to abandon his traditional marketing methods quite yet, but he’s banking that his showroom will pay off. “I see it as a way to sell one or two more homes per year,” Ernemann said.